The ER chuck 80P (FT 01043) is manufactured on a WEDM angle (FT 01338). It is developed based from the standards set for the fast clamping with set of F-tool stop beads. This device has an average height of 40 mm. A collet chuck is a specialized type of clamp used to hold workpieces on lathes for turning operations. These chucks are used to hold small to medium-sized work pieces on lathes, cylindrical grinders, rotary tables and other rotary machine tools. They are used in high speed turning applications and provide very accurate concentricity. Collet chucks hold the workpiece in place by pulling the spring collet back into the chuck body, causing the spring collet to close down and clamp the workpiece. Collet chucks can be manual, pneumatic or hydraulic. Be sure to determine the turning center's spindle type when choosing a collet chuck. 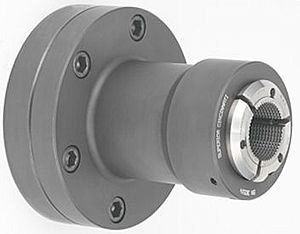 Some collet chucks are available for non rotating applications as well.